Amyotrophic lateral sclerosis (ALS) is a disease affecting the central nervous system that is either sporadic or familial origin and causing the death of motor neurons. One of the genetic factors contributing to the etiology of ALS is mutant SOD1 (mtSOD1), which induces vulnerability of motor neurons through protein misfolding, mitochondrial dysfunction, oxidative damage, cytoskeletal abnormalities, defective axonal transport, glutamate excitotoxicity, inadequate growth factor signaling, and neuroinflammation. Bee venom has been used in the practice of Oriental medicine and evidence from the literature indicates that BV plays an anti-inflammatory or anti-nociceptive role against inflammatory reactions associated with arthritis and other inflammatory diseases. The purpose of the present study was to determine whether bee venom suppresses motor neuron loss and microglial cell activation in hSOD1G93A mutant mice. Bee venom (BV) was bilaterally injected (subcutaneously) into a 14-week-old (98 day old) male hSOD1G93A animal model at the Zusanli (ST36) acupoint, which is known to mediate an anti-inflammatory effect. For measurement of motor activity, rotarod test was performed and survival statistics were analyzed by Kaplan-Meier survival curves. 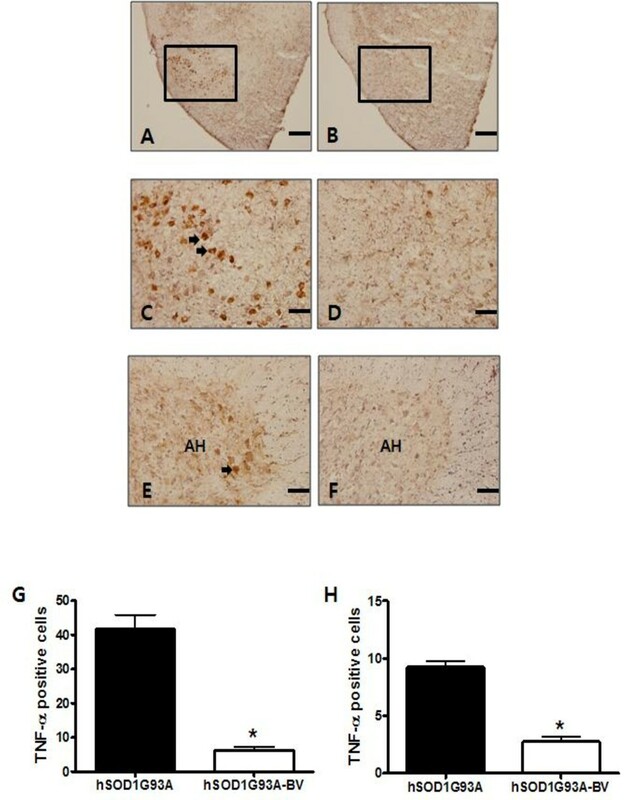 The effects of BV treatment on anti-neuroinflammation of hSOD1G93A mice were assessed via immunoreactions using Iba 1 as a microglia marker and TNF-α antibody. Activation of ERK, Akt, p38 MAP Kinase (MAPK), and caspase 3 proteins was evaluated by western blotting. BV-treated mutant hSOD1 transgenic mice showed a decrease in the expression levels of microglia marker and phospho-p38 MAPK in the spinal cord and brainstem. 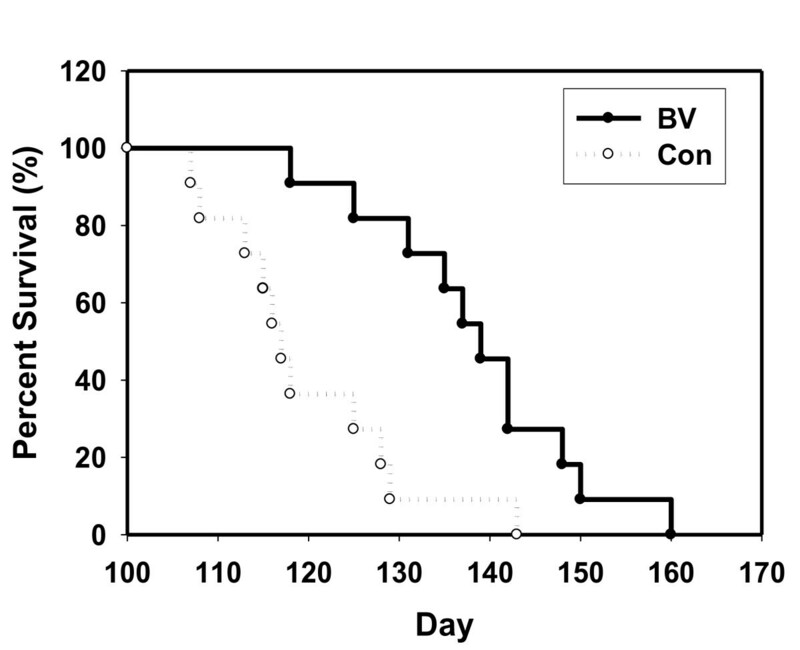 Interestingly, treatment of BV in symptomatic ALS animals improved motor activity and the median survival of the BV-treated group (139 ± 3.5 days) was 18% greater than control group (117 ± 3.1 days). Furthermore, we found that BV suppressed caspase-3 activity and blocked the defects of mitochondrial structure and cristae morphology in the lumbar spinal cord of hSOD1G93A mice at the symptomatic stage. From these findings, our research suggests BV could be a potential therapeutic agent for anti-neuroinflammatory effects in an animal model of ALS. Amyotrophic lateral sclerosis (ALS) is a severe paralytic disorder of the central nervous system (CNS) that is characterized by age-related degeneration or elimination of upper and lower large motor neurons of the motor cortex, brainstem, and spinal cord . ALS symptoms are characterized by muscle weakness, atrophy, spasticity, and paralysis . Riluzole therapy has been shown to only improve the survival of ALS patients by a few months and has several side-effects, including asthenia, nausea, anorexia, and diarrhea . Therefore, a safer and more effective therapy for ALS patients is needed in order to reduce the pain associated with this disease. Most ALS patients have the sporadic form of the disease while 5-10% of ALS cases are of the familial type. Familial ALS (fALS) cases are caused by autosomal dominant mutations of the human Cu-Zn superoxide dismutase 1 (hSOD1) gene . An animal model of ALS has been characterized in mice that carry the mutated hSOD1 gene with a glycine to alanine substitution at the 93rd codon (SOD1G93A). These animals display progressive motor neuron degeneration that is similar to that observed in cases of human ALS . In vivo and in vitro studies using mutant hSOD1 transgenic mice have demonstrated multiple cellular pathogenic events in motor neurons such as glutamate excitotoxicity, mitochondrial dysfunction, protein misfolding, neurofilament accumulation, and oxidative stress [2, 6, 7]. Neuroinflammation is a pathological feature present in ALS patients and in the mutant hSOD1 mouse model . As critical mediators of inflammation, activated microglia and elevated levels of tumor necrosis factor-alpha (TNF-α) are detected in the CNS of ALS patients and in hSOD1G93A transgenic mice . Previous findings point towards the critical involvement of microglia in the development of motor neuron disease; however the nature of microglial-neuronal interactions that lead to motor neuron degeneration remains unknown. One possibility that has been extensively studied in the context of other neurodegenerative diseases, especially Alzheimer's disease (AD), is the notion that chronic and detrimental microglial neuroinflammation contributes to neuronal degeneration . Another study demonstrated that p38, a 38 kDa Stress Activated Protein Kinase/Mitogen-Activated Protein Kinase (SAPK/MAPK), has a key role in the development of inflammation . Inhibition of p38 has been shown to produce anti-inflammatory effects by reducing cytokines such as TNF-α, interleukin-1 (IL-1), and nitric oxide synthetase (NOS) as well as by decreasing Cox-2 in inflammatory cells . Elevated levels of TNF-α and TNF-α medicated signaling pathways are evident in a large number of neurological disorders including multiple sclerosis (MS), AD, Parkinson's disease (PD), and ALS [12–15]. Furthermore, pro-inflammatory cytokines, such as TNF-α and interferon-gamma (IFN-γ) have been proposed to be involved in ALS-like microglial activation and inflammation-induced motor neuron death [16, 17]. Bee venom (BV), which is also known as apitoxin, is extracted from honeybees and is commonly used in Oriental medicine. The anti-inflammatory action of BV has shown to reduce pain in patients with chronic rheumatoid arthritis and osteroarthritis . However, the mechanism by which these anti-inflammatory properties relieve the neuroinflammation associated with neurodegenerative disease is not clear. In order to explore this therapeutic mechanism, we investigated the anti-inflammatory effects of BV on motor function and survival in SOD1G93A mutant mice. The present study showed decreased levels of TNF-α and the deactivation of p38 MAPK downstream of the TNF-α signaling pathway in both the brainstem and spinal cord of hSOD1G93A mice after treatment with BV in the hind limbs at the ST36 acupoint. Interestingly, BV treatment reduced the number of microglial cells and astrocytes, and dramatically increased the expression of MAP2 in motor-related regions of the brainstem and spinal cord in comparison with age-matched hSOD1G93A control mice. Additionally, we showed that BV suppressed caspase-3 activity and reduced the disruption of mitochondrial structure and cristae morphology in the lumbar spinal cord of hSOD1G93A mice. Furthermore, BV treatment improved the motor coordination and prolonged the life span of familial mutant ALS animals at a symptomatic stage. 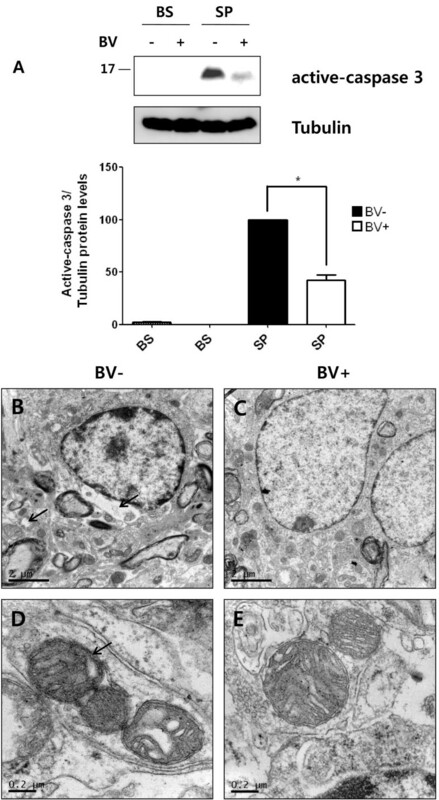 Based on these findings, we suggest that BV has a neuroprotective effect against motor neuron cell death and suppresses neuroinflammation-induced disease progression in symptomatic ALS mice model. All mice were handled in accordance with the guidelines of the United States National Institutes of Health (Bethesda, MD). The protocols were approved by the Institutional Animal Care and Use Committees of the Korea Institute of Oriental Medicine. Hemizygous transgenic B6SJL mice carrying a glycine to alanine base pair mutation at the 93rd codon of the cytosolic Cu/Zn superoxide dismutase gene (hSOD1G93A) were originally obtained from the Jackson Laboratory (Bar Harbor, ME). Transgenic mice were identified by PCR as described previously . The hSODG93A mice developed the initial signs of neuromuscular deficits, such as leg tremors and loss of the hindpaw extension reflex, at approximately 15 weeks of age. At 16 weeks, they showed marked locomotor impairment with paralysis and muscular atrophy of the hind limbs. These animals died due to respiratory failure at 18-20 weeks of age. The 14-week-old transgenic mice were considered to be symptomatic; mice of this age were used for the study. All mice were kept in standard housing with free access to water and standard rodent chow. Bee venom was purchased from Sigma (St. Louis, MO) and diluted with saline. At a dose of 0.1 μg/g, bee venom was bilaterally injected (subcutaneously) into 14-week-old (98 day old) male hSOD1G93A transgenic mice (hSOD1G93A-BV, n = 11) at the Zusanli (ST36) acupoint, which is known to mediate an anti-inflammatory effects . BV treatment was performed two times a week at a dose of 0.1 μg/g. According to the human acupoint landmark and a mouse anatomical reference , the ST36 point is anatomically located at 5 mm below and lateral to the anterior tubercle of the tibia. Control animals were bilaterally injected (subcutaneously) with an equal volume of saline at the ST36 acupoint (hSOD1G93A, n = 11). Mice were trained for 1 week in order for them to acclimate to the apparatus. After training of the hSOD1G93A mice, their basal motor activity was measured with a rotarod apparatus (Ugo, Basil, Italy). Motor coordination was assessed by measuring the length of time that the mice remained on the rotating rod (10 rpm) as was previously described . Each animal underwent three trials and the average time spent on the rod was determined for each group. Rotarod testing was conducted at the same time to reduce environmental variables such as light cycle and temperature. For lifespan analysis, SOD1G93A mice were assessed for a total of 100 days and divided into the following treatment groups: saline-treated SOD1G93A mice (n = 11) and SOD1G93A mice treated with BV at 14 weeks (98 day old) old (n = 11). We defined "death" that is, the end point of life for hSOD1G93A mice as the first day on which the mouse stopped movement on either side, after which time the mouse was no longer able to eat due to severe hindlimb paralysis. Mice were then sacrificed to reduce further pain from respiratory failure according to animal care guidelines. The life span analysis was carried out in male SOD1G93A mice. Survival statistics were analyzed by Kaplan-Meier survival curves by Prism 4.0 software (GraphPad Software, San Diego, CA) and Sigmaplot 10 software (Systat Software, Inc. Richmond, CA). Values were analyzed by a one-way ANOVA followed by a Dunn's multiple-comparison test. All statistics were performed and graphs were developed using Prism 4.0. At 18 days after treatment with BV or saline, hSOD1G93A mice were deeply anesthetized with pentobarbital. They were transcardially perfused with phosphate-buffered saline (PBS), followed by a perfusion with a fixative solution containing 4% paraformaldehyde in PBS. The spinal cord and brain were dissected out and fixed overnight in 4% paraformaldehyde at 4°C, transferred to 30% sucrose, and then frozen. The spinal cord and brainstem were embedded in OCT compound and serially cut on a cryostat into 40-μm thick coronal sections. The sections were then floated in PBS and quenched with 30% methanol and hydrogen peroxide to eliminate endogenous peroxidase activity. After blocking in 5% normal goat serum at room temperature, sections were incubated with the primary antibodies, which included Iba-1 (Wako, Osaka, Japan) at 1:5000 or TNF-α (Cell Signal, Beverly, MA) at 1:100. All tissue sections were rinsed in PBST (PBS with 0.3% Tween 20) and incubated in secondary antibody (1:1000) for 1 h. Following incubation, all sections were rinsed and stained using Vectastain ABC kits (Vector, Burlingame, CA) according to the manufacturer's instructions. For visualization, 3, 3'-diaminobenzidine (DAB)-H2O2 substrate was used with a hematoxylin counterstain. After rinsing, all samples were dehydrated in increasing concentrations of ethanol, cleared in xylene, and coverslipped using Permount mounting medium (Fisher Scientific, Pittsburgh, PA). Immunostained tissues were observed with a light microscope (Olympus, Tokyo, Japan). Every fifth spinal cord or brainstem section (50 μm) from saline- (n = 3) or BV-treated hSOD1G93A mice (n = 4) was stained with Iba 1 or TNF-α antibody. Cell counting for immunoreactive cells was performed using an image analysis software (IMT i-solution, Hackettstown, NJ). At 14 days after treatment with BV or saline, brains and spinal cords were dissected and homogenized in RIPA buffer (50 mM Tris-Cl pH 7.4, 1% NP-40, 0.1% SDS, and 150 mM NaCl). Homogenized tissues were centrifuged at 14,000 rpm for 20 min at 4°C. Proteins were quantified using the BCA assay kit (Pierce, Rockford, IL). Samples were electrophoresed through SDS-polyacrylamide gels and transferred to nitrocellulose membranes. Blots were blocked with 5% non-fat milk in TBS for 1 h prior to incubation with antibodies. Various primary antibodies were utilized in this study, including anti-SOD1 (Calbiochem, La Jolla, CA), anti-tubulin (Abcam, Cambridge, UK), anti-Akt (Cell Signaling, Beverly, MA), anti-pAkt (Cell Signaling), anti-p38 (Cell Signaling), anti-phospho-p38 (Cell Signaling), anti-Iba 1 (Wako, Osaka, Japan), and anti-active caspase-3 (Calbiochem). Blots were probed with HRP-conjugated antibodies (SantaCruz, Santa Cruz, CA) and developed with enhanced chemiluminescence (ECL) reagents (Amersham Pharmacia, Piscataway, NJ). BV-treated hSOD1G93A mice and age-matched controls were sacrificed and perfused with 2% glutaraldehyde. The procedure of sample preparation for TEM was performed as previously described . Results are expressed as means ± SEM values. Statistical evaluations were conducted using the Mann-Whitney U test for comparisons between BV-treated and age-matched untreated hSOD1G93A mice. A t-test was used to compare the immunoblotting and immunohistochemical data between the BV-treated mice and the age-matched untreated hSOD1G93A mice. P values less than 0.05 were considered significant. All analyses were performed with SPSS 12.0 software (SPSS, Chicago, IL). To determine the effects of BV on the survival and motor activity of hSOD1G93A mice, BV (0.1 μg/g) was bilaterally administered (subcutaneously) at ST36 (Figure 1). 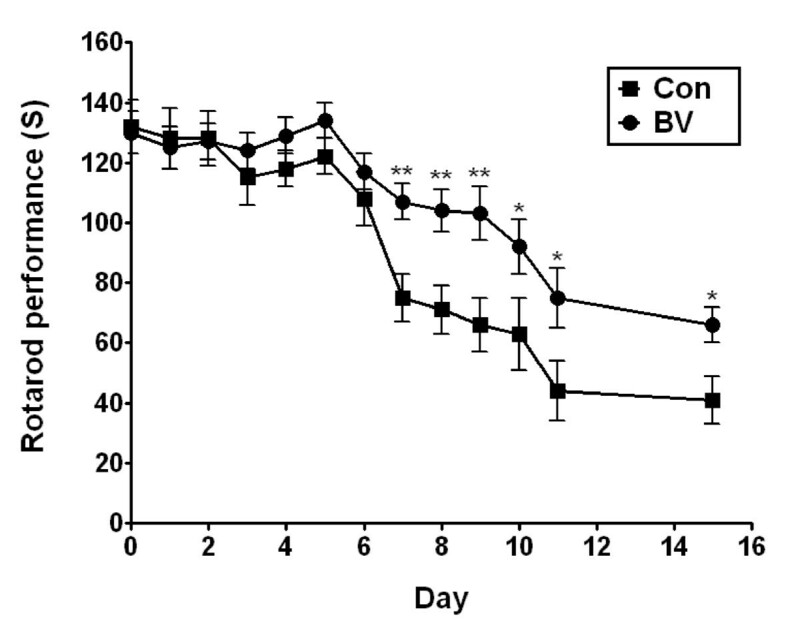 As shown in Figure 2, the BV-treated hSOD1G93A group displayed a 1.3-fold increase in motor function at 7 days after treatment with BV as determined by the rotarod behavioral test compared to age-matched control mice. Furthermore, we observed that BV-treated mice had a delay in disease onset and paralysis compared to saline-treated hSOD1G93A mice. Next, we examined the survival rate to determine whether BV treatment prolonged the life span of hSOD1G93A mice. The expected life span was assessed by Kaplan-Meier survival analysis. The median survival of the BV-treated group (139 ± 3.5 days) was 18% greater than control group (117 ± 3.1 days). The Kaplan-Meier probability of survival analysis showed that the BV-treated group had a significantly improved survival rate (160 ± 3.5 days) compared to the control group (143 ± 3.1 days) (Figure 3). However, there was no significant difference in body weight before and after BV treatment (data not shown). These results indicate that BV acted therapeutically against the onset of motor dysfunction as well as against disease progression in hSOD1G93A mice. Effects of BV on rotarod performance of hSOD1 G93A mice. BV delays the onset of motor impairment in hSOD1G93A transgenic mice. B6 G93A-SOD1 mice (n = 11/group) were injected with saline (squares) or BV at ST36 (circles). Values represent the mean ± SEM. Significantly improved motor performance was evident at most time points between 7-9 days after BV treatment as compared with controls. The Mann-Whitney U test was used to compare saline-treatment versus BV-treatment in hSOD1G93A transgenic mice (**p < 0.005, *p < 0.05). S: second, Con: saline treated-mice, BV: bee venom treated-mice. BV prolongs the survival of hSOD1 G93A transgenic mice. A Kaplan-Meyer analysis illustrates the significant benefits from BV (0.1 μg/g/98day) compared with the control regarding survival rate. Mice were bilaterally injected with saline (open circles) or BV (closed circles) at ST36 (subcutaneously). The mean, median, minimum, and maximum age of death in saline-treated hSOD1G93A mice are 120, 117, 107, 143 day, respectively. The mean, median, minimum, and maximum age of death in BV-treated hSOD1G93A mice are 139, 139, 118, and 160 day, respectively. Con: saline-treated mice, BV: bee venom-treated mice. Microglia activation can be observed in virtually all CNS pathologies including ALS. However, the role of the microglial response in many CNS disorders remains ambiguous, given that these cells exhibit both neuroprotective and neurotoxic effects . To demonstrate whether BV affected neuroinflammation in a familial ALS animal model, we studied the relationship between microglia activation and inflammatory factors in symptomatic hSOD1G93A mice. 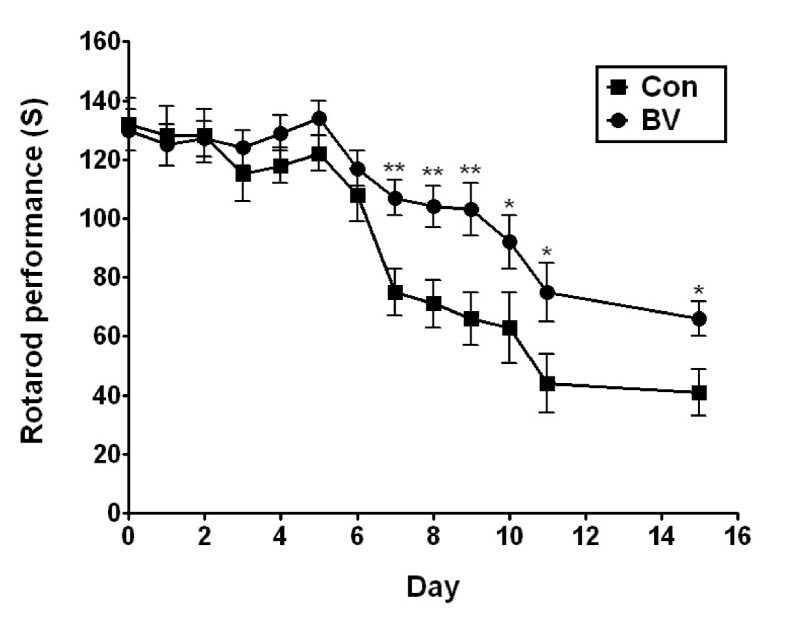 For this experiment, BV or saline was injected at ST36 in 14-week-old hSOD1G93A mice. The effect of BV on activated microglial cells monitored using the Iba-1 antibody in both the brainstem and lumbar spinal cord of symptomatic hSOD1G93A mice. As shown in Figure 4A, the expression level of Iba-1 was dramatically reduced in both the brainstem and spinal cord of BV-treated mice in comparison with the control group. Next, we immunostained lumbar spinal cord sections from BV- or saline-treated mice (Figure 4B-G). At a low magnification, Iba-1 immunoreactivity was detected in both the white and gray matter of the spinal cord in hSOD1G93A transgenic mice (Figure 4B,C). At a higher magnification, Iba-1 immunoreactivity in the ventral horn of BV-treated hSOD1G93A mice was significantly reduced (~2.8 times) as compared to the identical area in control mice (Figure 4F). In the brainstem of mutant SOD1 mice, Iba-1 immunoreactive cells were detected as well (Figure 4D,E). BV caused an approximate 2.4 fold decrease in microglial activity within the facial nucleus of the brainstem (Figure 4G). In order to determine whether BV suppressed neuroinflammation by inhibiting of the release of the pro-inflammatory cytokine TNF-α, we further examined the level of TNF-α by immunohistochemistry in BV- or saline-treated familial ALS mice. As expected, TNF-α immunoreactivity in hSOD1G93A mice was largely confined to the facial nucleus of the brain stem and motor neurons in the anterior horn of the spinal cord (Figure 5A,C, and 5E). Interestingly, BV caused a significant 4-fold reduction in TNF-α immunoreactivity in both the brainstem and lumbar spinal cord (Figure 5B,D, and 5F-H). These results suggest that BV treatment may be involved in an anti-neuroinflammatory responses that reduces motor neuron degeneration and prolongs the life span of hSOD1G93A transgenic mice at the symptomatic stage. The caspase family plays an important role in the pathogenesis of CNS disorders . Caspase-3 activation, which has been detected in ALS patients , and mutant SOD1 expression have been shown to induce caspase-dependent neuronal apoptosis in vitro . To assess whether BV affected mitochondrial cell death in symptomatic mutant SOD1 mice, we performed immunoblotting analysis of homogenates of the spinal cord and brainstem using a caspase-3 antibody. Expression levels of the active caspase-3 fragment were markedly increased in the lumbar spinal cord of hSOD1G93A mice, but caspase-3 expression was maintained at a very low level in the spinal cord of BV-treated hSOD1G93A mice. More specifically, caspase-3 expression was found to be reduced by 80% relative to the level observed in untreated hSOD1G93A mice (Figure 6A). Next, we asked whether BV affected the mitochondrial ultrastructure in the lumbar spinal cord of symptomatic hSOD1G93A mice. We used transmission electron microscopy (TEM) to visualize mitochondria from the anterior horn of the lumbar spinal cord from BV- or saline-treated mutant SOD1G93A mice. In symptomatic familial hSOD1G93A mice, mitochondria displayed vacuolation and broken cristae (Figure 6B,D). By contrast, mitochondrial cristae were shaped as compact tubules in an orderly fashion in the ventral horn of the spinal cord from BV-treated (Figure 6C,E). These studies demonstrated that BV serves a protective role in regulating mitochondrial structure and cristae morphology. Next, we asked whether BV-induced signal transduction pathways affected neuron death and gliosis in hSOD1G93A mice. As shown in Figure 7A, Western bolt analysis revealed an increase in the expression of the neuronal cell marker MAP2 in both the brainstem and lumbar spinal cord of BV-treated symptomatic hSOD1G93A mice. In addition, GFAP was significantly reduced in the BV-treated brainstem and spinal cord when compared with age-matched familial mutant SOD1 mice (Figure 7B). These data suggest that BV-treatment at ST36 had a neuroprotective effect via activation of a cell survival signal transduction pathway, which reduced ALS-associated motor neuron death from gliosis and neuroinflammation. To evaluate the mechanism by which BV mediates this neuroprotective activity, we examined the expression levels of phospho-p38 MAPK and several anti-apoptotic markers, such as phospho-Akt and phospho-ERK, in symptomatic hSOD1G93A mice. 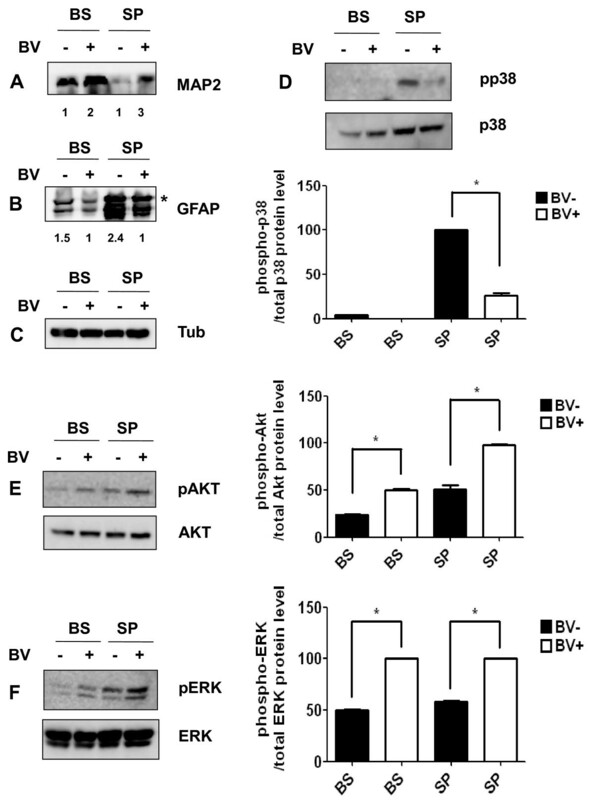 Western blotting experiments using anti-phospho-p38 or Ser435-phospho-specific Akt1 antibodies demonstrated activation of Akt-1 and deactivation of phospho-p38 in the spinal cord and brainstem following treatment with BV (Figure 7D,E). Furthermore, BV-treatment dramatically increased the expression of phospho-ERK in the spinal cord and brainstem of familial mutant SOD1 mice (Figure 7F). These biochemical results support that previous observations indicating that BV at ST36 improved motor activity and increased survival rates of hSOD1G93A mice (Figures 2 and 3). The molecular targets and signaling pathways influencing paralysis in ALS are not completely understood. To date, several pathogenic mechanisms have been identified that contribute to atrophy and paralysis in ALS patients, including protein misfolding, mitochondrial dysfunction, oxidative damage, cytoskeletal abnormalities, defective axonal transport, glutamate excitotoxicity, inadequate growth factor signaling, and neuroinflammation. In this study, we demonstrated that administration of BV at a symptomatic stage of disease progression resulted in increased motor activity and a prolonged life span in comparison with age-matched control mice. Furthermore, we observed that BV prevented neuroinflammation-induced death of motor neurons and alleviated mitochondrial disruption in symptomatic SOD1G93A transgenic mice. Microglia in the CNS are immunologically active and capable of responding to events associated with formation of the neuronal-glial environment. Moreover, evidence indicating that microglial cells are involved in the progression of ALS pathogenesis has emerged from several lines of investigation. For example, activated microglia are typically found in ALS patients and in mouse models of ALS . In addition, microglia have been shown to increase pro-inflammatory cytokines, reactive oxygen species (ROS), and glutamate in response to stimuli from neurons and astrocytes, which include pro-inflammatory cytokines and neurotrophic factors . The pro-inflammatory cytokine TNF-α is a member of the TNF superfamily, which is a class of cytokines known to promote inflammatory signaling . TNF signaling occurs through many factors including intracellular signaling pathways, nuclear factor kappa-B (NF-kB), p38, and c-Jun N-terminal kinase (JNK), which results in a number of responses such as inflammation, proliferation, cell migration, and necrosis [30, 31]. TNF signaling has been shown to have several important functions within the CNS , including injury-mediated microglial and astrocyte activation . Elevated levels of TNF-α and activation of TNF-α-mediated signaling pathways are evident in a large number of neurological disorders including AD, PD, and ALS [13–15]. In addition, cytokines TNF-α has been proposed to be involved in ALS-like microglial activation , and inflammation by this cytokine has been shown to induce motor neuron death . In accordance with previous reports [27, 15], the present study showed that microglial cell activation and increased TNF-α cytokine levels were involved in ALS pathologies involving both the spinal cord and the facial nucleus of the brainstem in symptomatic familial hSOD1G93A mice (Figures 4, 5). Interestingly, we found that BV administration at the ST36 acupoint significantly attenuated neuroinflammatory events triggered by TNF-α and microglial cell activation in motor function related-structures within the spinal cord and brainstem (Figures 4A, 5G-H). Some reports have also suggested that BV may be an efficient treatment for multiple sclerosis (MS) and other autoimmune diseases based on the inhibition of TNF-α production [34, 35, 18]. These findings suggest that BV treatment may be useful for combating inflammation in ALS patients. Previous reports have indicated that a common mechanism of toxicity associated with the mutant form of SOD1 is the sequential activation of caspase-1 and caspase-3 . Since caspase-3 activation leads to microglial cell activation and mitochondrial dysfunction, we examined whether caspase-3 inactivation was involved in the anti-inflammatory effect of BV. We found that the levels of active caspase-3 were significantly reduced in the lumbar spinal cord of hSOD1G93A mice following BV treatment (Figure 6A). Furthermore, the administration of BV prevented the disruption of mitochondrial cristae and vacuolization in the ventral horn of hSOD1G93A mice at the symptomatic stage (Figure 6B-E). This result suggests that BV treatment had an anti-inflammatory effect on the CNS of familial mutant SOD1 mice. Thus, we hypothesized that BV-treatment reduced motor neuron death and mitochondrial dysfunction by preventing neuroinflammation. 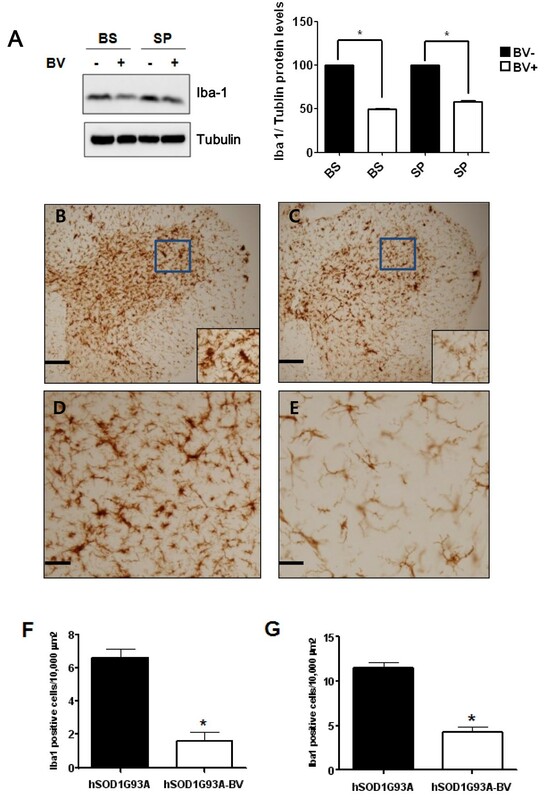 Supporting this idea, BV treatment significantly increased the expression of a neuronal cell marker and reduced GFAP levels when compared with age-matched hSOD1G93A transgenic mice (Figure 7A-B). Accordingly, a reduced number of astrocytes and diminished cytokine levels positively influenced neuronal survival and inhibited mitochondrial dysfunction which otherwise might have led to increased levels of reactive oxygen species (ROS) and glutamate release associated with ALS . With respect to the molecular mechanism underlying BV, we observed that BV treatment triggered a reduction in the activation of p38 MAPK, which is downstream of the TNF-α signaling pathway in the spinal cord of hSOD1mice (Figure 7D). In contrast, the levels of phospho-AKT and phospho-ERK were increased in both the brainstem and spinal cord of BV-treated hSOD1 mice compared to those of control mice (Figure 7E-F). These results demonstrate that BV-treatment of familial mutant hSOD1 transgenic mice caused a reduction in pro-inflammatory cytokines and an increase in phospho-Akt and ERK, which may inhibit motor neuronal cell death by preventing neuroninflammation and consequently delay disease onset. This study presented that the improved motor activity and prolonged life span of BV-treated hSOD1G93A mice were attributable to the neuroprotective effect provide by reduced levels of cytokines, which are typically released by activated microglia and astrocytes. Furthermore, the present study illustrated that BV treatment prevented mitochondrial disruption and served a neuroprotective role in vivo via the activation of cell survival signal transduction pathways, such as the PI3K and ERK pathways, which subsequently protected against the death of motor neurons in symptomatic hSOD1G93A mice. Further challenges remaining will be to determine whether bee venom treatment at other acupoints presents neuro-protective effects against neuroinflammation in symptomatic ALS mice and find the potential bioactive element of bee venom components in vivo and in vitro. This research was supported by grants from the Korea Institute of Oriental Medicine (C09020, K09050, C10040). EJY designed the experiments and analyzed the data as well as wrote the manuscript. JHJ carried out the rotarod test, immunohistochemistry and performed statistical analyses. SML and HSH participated in the tissue processing of animal for all experiments. SCY contributed technical expertise for TEM. MSL and SMC helped editing of the manuscript. All authors have read and approved the final manuscript. All data collection and observations were completed by a blinded observer.